Double Olympic champion Rebecca Adlington says she is receiving therapy for panic attacks and hopes "talking about it more" will put a stop to the "big stigma" around mental health. The 30-year-old mum of one admits it has taken six months for her to get help for her anxiety. "It's every single night going to bed that I start feeling panicky," she told BBC Radio 5 Live's Friday Sports Panel. She added: "I'm not an alien just because I suffer from panic attacks." Adlington has competed in two Olympic Games - winning two golds in the 800m and 400m freestyle in Beijing in 2008, followed by bronze in those events in London four years later. Watch: Rebecca Adlington: Why I'm going through therapy? But since her retirement in 2013, and the subsequent loss of the extra support offered to British athletes, she said her anxiety grew. "I've always kind of had something looming but very, very rare. I probably had two panic attacks a year when I was competing it was that rare." The trigger came with the loss of her grandfather in 2018. "Since then it's just been every single day, every single week just really, really intensified. And I thought, hold on - if you're having them once or twice a year that's manageable, but when you are having them week in and week out it's just debilitating to be honest. "When you live on your own, when you're a single parent, I'm just so focused on putting my daughter to bed and then I'm just left on my own and that's when my mind starts over-thinking. I start ticking and I get all worked up and panicky about it." 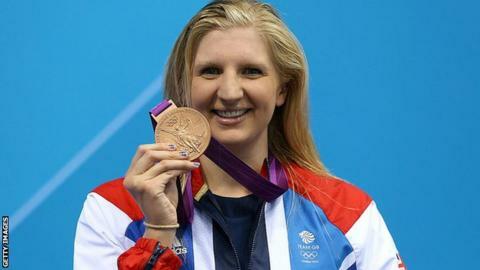 Adlington chose to open up about her panic attacks on social media and says the response has been "brilliant". "It's about talking about it more. There's such a big stigma about it and actually it's about normalising it. If anyone is out there who is following me and is going through exactly the same, I just want them to be able pluck up the courage and to go and seek help as well. "Yes, it's a long and slow process. Athletes we want quick fixes don't we - we're injured, sort us out and get us better. "But therapy isn't like that. I'm three months into it and definitely feeling a lot better. I now know how to manage a panic attack, I've probably had one in the past few weeks, which for me is huge. "It's definitely getting a lot better, more manageable and it's one of those I feel a lot better for as well."